Since a few days our new press release is published. It gives a brief overview of the project and presents new research results from this year. For example, we were able to delight about positive results in the nature conservation monitoring of our plantations. Daphne – our project partner for applied ecology – found out that in the poplar plantations of D4EU significantly more species lived than in the adjacent cereal and maize fields. The species benefited especially from the flowering undergrowth of the poplars. Even very rare species were rediscovered that had not been observed for years. There is also good news regarding the growth of our poplars. Although the year was quite dry and warm, the poplars recorded an enormous increase. 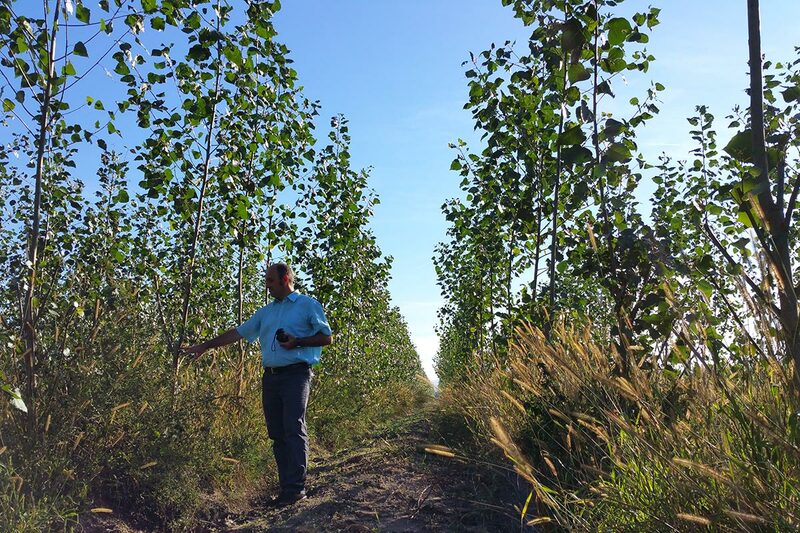 Poplars, which were planted as 1 meter high cuttings in May, impressed in mid-September with a height of more than 4 meters. Also our technical manager Dr. Matthias Meyer (see picture) could hardly believe that he is standing in the same short-rotation plantation as in May. He shows how tall the cuttings were when he took samples for the quality control and the greenhouse growth experiments during the planting. In these experiments interesting new findings could be obtained. Now, we know which poplar varieties have a particularly good root growth, which one put their strength rather in the stem expansion and which one cope best with drought stress. This is a great help to select the most suitable poplar varieties for our plantation sites in Slovakia.